T and I had several friends over to watch the Superbowl this Sunday. Last week was a little crazy for me, I traveled to New York for work and didn't get home until 10:30 on Friday night. Saturday morning I got up early and headed to Columbia for a baby shower, and wound up spending the night there. So when I got back to Greenville Sunday at noon the thought of coming up with a menu to feed 12 people was a little bit daunting. I opted for options that had a really quick prep time. I put these three dishes together in less than an hour. 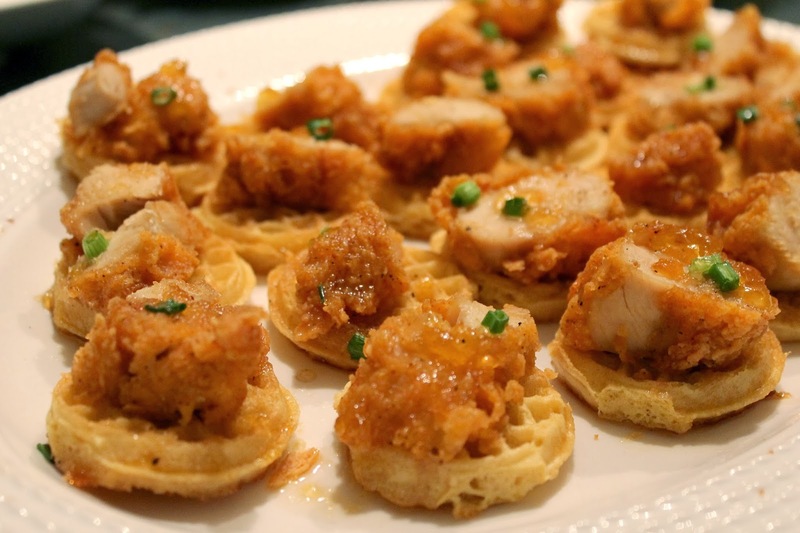 First on the menu: Chicken + Waffle Minis from A. Liz Adventures. This was my first time making these, and they were so simple to prepare. I used the entire package of Eggo minis, which yielded 40 mini bites. One pound of chicken tenders cut up into bite-sized portions was the perfect amount to cover each waffle. I toasted the waffles in the oven at 450 to get them brown on each side, topped with the chicken, and then drizzled the sauce over top. Second: Trisha Yearwood's Charleston Cheese Dip, y'all this dip was so good. 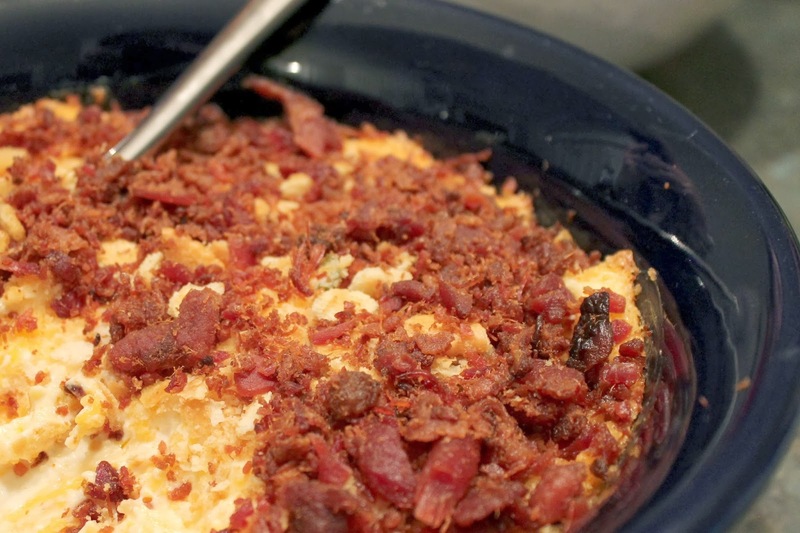 It's kind of like a warm pimento cheese, minus the pimentos and add bacon on top. We used Ritz crackers and celery sticks for dipping. I doubled the recipe and used precooked bacon crumbles instead of frying up my own. Time was of the essence, and I really hate to cook bacon. I will be making this again, especially during football season. Third: Cream Cheese Vegetable Squares, because you always need something green on the appetizer table. I've been making these since I was in college, and they are so simple. 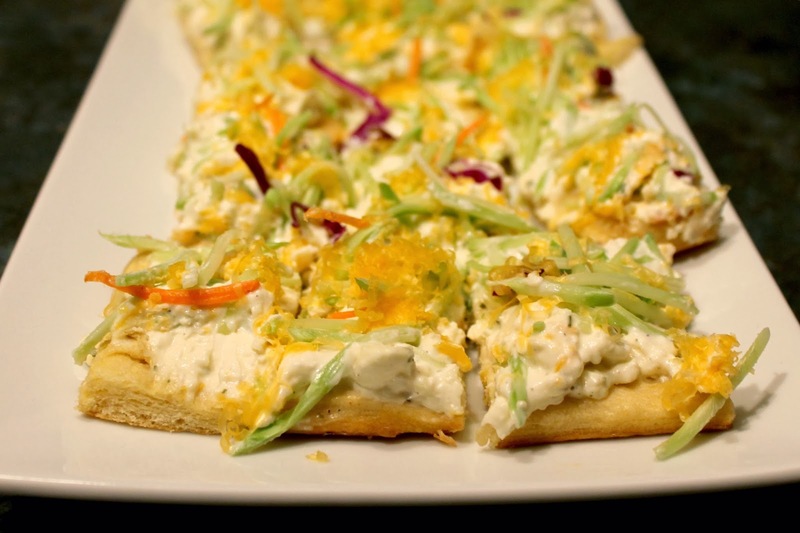 Just spread a crescent roll out and bake it, top with a seasoned cream cheese mixture, and sprinkle with cheddar cheese and broccoli slaw. I also bought two frozen pizzas and had them as back-ups just in case we were running low on food. Every time I make them as an appetizer they are always a hit. I just call them a "flatbread" and cut them up into squares. Fools people every time. I hope y'all had lots of good food on Sunday, too! That's what the night is all about, right? Those chicken and waffle minis look so, so good! I remember seeing them on Aprils blog awhile ago, but completely forgot about them! I'll be making these soon, for sure. Who cares if the Super Bowl is over?! This all looks so good! I am defiantly going to try some of these. I make the coconut chicken I got from your blog a lot. Everything looks amazing and I'll have to keep all these recipes in mind. I can't wait to try the cream cheese veg squares. Those cream cheese squares look so good, and how easy?! I had Matt whip up some jalapeno poppers, found here- http://www.pinterest.com/pin/183943966004616111/- everyone loved them! Including me, and I don't typically like spicy. All looks yum, girl. You are good for coming up with these in an hour after your busy week!